I thought I'd open a new topic for concert dates which is a bit more general than the topic Wild Energy tour. Great idea to open this topic! I Wish Ruslana great success! Her main site has a new banner about that. WOW! You are lucky! I hope you will share your experience and photos with us. Hi. How are you doing over here? Yes, we are lucky to visit some Ruslanas' concerts. Hopefully I will go to Lviv. That would be cool! I'm sure that it will be much different photos than we know. Hopefully I will go to Lviv. I wish you the same, another wonderful concert! Great! I am looking forward to it! Wow! What are you going to study? Lucky you! There are so many concerts in Ukraine to choose from. I keep my fingers crossed that you will manage to meet her this time. Thank you. But I do not think so, as somebody will forget again to call. "Odesa" sounds quite ... achievable! So are you thinking about going there? But I do not think so, as somebody will forget again to call. Sure! But I hope I will find a direct route...to avoid passing through Moldova! A strange visa was "invented" few months ago! Fine! I took a look to the map. You can bypass this country through both sides as Romania is neighbour with Ukraine. Thanks fo the tips! On West...at least 5 days by car! On East...crossing the Danube by a feriboat! Probably I will choose this one! I will be there, anyway!I hope! Not at all! Maybe you won't need a ferry. I've found one road in Ukraine which allows you to go on land through the eastern way without using a ship. I've found one road in Ukraine which allows you to go on land through the eastern way without using a ship. The problem seems to be that there is really no road crossing the border between Romania and Ukraine at the Southern end of Moldova. At least I can't see any border crossing on my map. On West...at least 5 days by car! On East...crossing the Danube by a feriboat! If there is a ferry instead of a bridge, it shouldn't be too difficult. Probably I will choose this one! I will be there, anyway!I hope! Yeap! And the only thing I know about it...It is the city only, like the last year! No information about tickets or something like that! Uffff! It will be 100% my "pleasure" again! Uffff!Uffff! I thought that this forum is an effective one! But...confusing the Danube with the "Dnistr" is...too much for me! Like confusing Naomi with... this wonderfull creature ...Niki! No information about tickets or something like that! I was not trying to find Danube for you, but to circle the possible eastern way to Ukraine around Moldova with no need to use ferry for you. I'll better circle much larger area next time to avoid confusion like this. Sorry. a bit more general than the topic Wild Energy tour. Have a wild time there! US fans are rarity in the forum, haha. I wonder where flipsty disappeared. I wish you a second Ruslana-meeting! I thought that this forum is an effective one! Do not worry, I will call to some fans and they will meet you, but they do not know English. I can tell ask them what you want. You will be present there, be sure. This is my story, the photos you will see later. The same story I posted in the Ukr. topic about Lviv. Most of the fans arrived to Lviv in the morning, others arrived later. It happened so, that the hotel where we had to stay at was busy, then we found another one, it was a hostel, it was situated near the square where the concert took place. When all the fans arrived, we went around the city, Lviv. We came to the square where we were present during Ruslana's sound-check. The concert started at 6 in the evening. Many famous singers of marvellous Lviv performed during the concert: Pikkardijska Tertsia, Natalya Karpa, Ruslana. At about 9 in the evening, the fans got into the fan zone, where we waited for Ruslana's contcert. 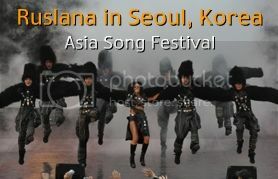 Ruslana's concert was just amazing, it was Great Grand Show. Ruslana sang songs from different albums: Amazon, WE, WD, the song "Svitanok", and Ukrainian folk songs. It was awesome. Ruslana and the ballet "Zhyttya" changed their costumes during the concert too. All of those mirrored very good and awesome atmosphere. Ruslana's concert became a great present for citizens of Lviv. The audience was very emotional and danced. Having much space in the fan zone, the fans danced Arkan and Kolomyjka. After the concert we met Natalya Stepanivna. Some time later, we saw Ruslana who came up to the car, she got into it, but she came out of the car straight away, as the fans would not let Ruslana to leave. Ruslana is strong personality, after the performance, she gave autographes and the fans could take photos too. ( I am happy, I did it too, it was very pleasant). Before midnight, we came into the hotel. We started to celebrate Kvita's new position in the fan club. Then we went to bed, some fans celebrated it till 6 in the morning. On the 25-th of Aug. the fans went on excursion. I do not know where they were, as I went to Ternopil early in the morning. They still slept, when I was leaving (they are big lovers to sleep). We Thank a Lot to Ruslana, ballet "Zyttya", organizers for so marvellous Grand Show! It became a real feast! Thanks for the story! Congratulations! You did it, HEY YA! !